Designer and homeowner Sandy Goodkind chose a restful palette that lets the open floor plan flow and keeps the emphasis on the plentiful outdoor views. The living roomâs design started with the blue-and-white toile fabric on the Ralph Lauren chairs. A bit of coral is a nod to the homeâs waterfront location. 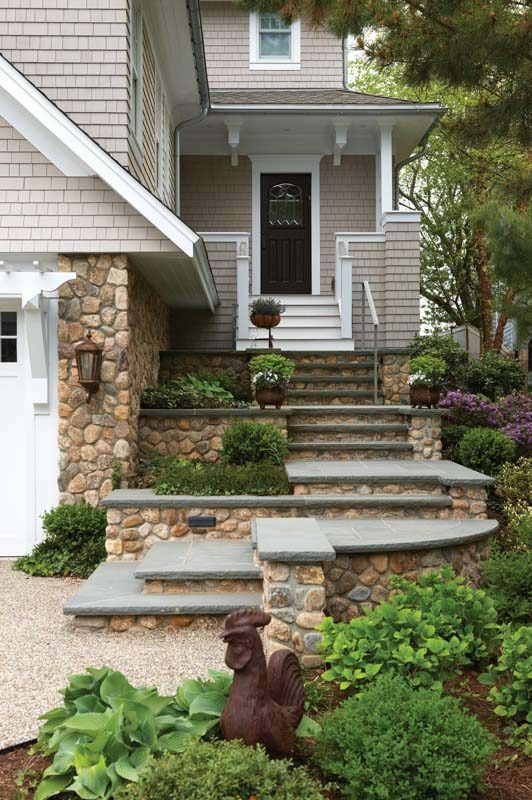 Stone steps lead to the front door, which opens to the homeâs second level. A faux-antique mirror is a focal point in the foyer. Texture in the grass cloth wallpaper, linen dining chairs and oxidized zinc table top-plays a big role in the design. An antique dental table from Paris is part of the mix in the family room. The wet bar was crafted from old barn floorboards and a set of Victorian leaded-glass windows. An old ceiling tile Sandy found at the Brimfield Antique Show has a place of honor behind the Lacanche stove. The covered porch on the first level is a second family room in the warm months. Stone walls give the porch its cozy feel. The porch’s stone pillars anchor the home to the site. A freestanding tub is the focal point of the third-floor master suite’s bath. The house looks out over the Thimble Islands. The master bedroom’s pewter-colored walls are hand-painted to look like damask. The summer house the Goodkinds had enjoyed over the years wasn’t quite big enough for year-round living, Sandy says. What’s more, she’d grown tired of their other home, a large colonial that she says was “dark, dark, dark.” The solution was clear: it was time to move. The basement level became the home’s first floor and now holds a family room, a study, a bathroom and a bedroom. The second level holds the living spaces—dining and living rooms, kitchen, another family room—as well as the couple’s daughter’s bedroom. The third floor belongs to Sandy and David alone, with its spacious master bedroom and bath. 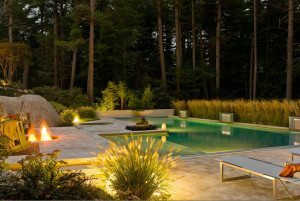 At the front of the house, a walkway leads from the driveway to the front door—which opens to the second level of the house—via a gentle rise up wide stone steps bordered by welcoming landscaping. For the main living area, Sandy and Terry struck the balance by creating an open floor plan embellished with pilasters and ceiling beams that define spaces and add a classic touch. “I wanted it to be open but cozy,” Sandy says. Sandy filled the space with furniture and accessories that run the gamut from contemporary to antique to somewhere in between. Sleek dining chairs covered in beige linen surround a table composed of a slab of oxidized zinc nailed to an old trestle. An antique dentist’s cabinet she found in Paris sits next to a clean-lined sofa in the living room. And in the stair hall a wet bar crafted of old barn floorboards has cabinet doors made from a set of antique diamond-paned leaded-glass windows Sandy had been saving for just the right use. When she’s not helping people design their living spaces, Sandy designs jewelry that she sells at her Branford shop, Crowning Glory. Her house is a reflection of her design sensibilities in every area. “Everything—what I wear, my jewelry, what I surround myself with—I like it all to have a little age, a history,” she says.